I previously wrote about The Chopin Manuscript audiobook for The Rap Sheet back in mid-September. At that time, I gave background information on this International Thriller Writers project, which was the collective effort of 15 authors working sequentially on furthering a plot line that had been initiated by Jeffery Deaver (The Sleeping Doll). I hadn’t listened to Chopin in its entirety at the time, but I have since. It is a remarkable achievement of collaboration in both scope and execution. And hey, it’s damn entertaining, to boot. The Chopin Manuscript runs 17 chapters long, with most of those averaging roughly 24 minutes. Deaver sets the roiling pace with his opening chapter. This story’s plot revolves around main protagonist Harold Middleton, a 56-year-old former United States Army colonel and ex-member of a United Nations intelligence team that hunted war criminals in Yugoslavia. Middleton is also a recognized musicologist, currently on a trip to Poland. After Henrik Jedanok, a Polish piano tuner and music collector, gives Middleton a manuscript by 19th-century composer Frédéric Chopin for inspection--a manuscript that Middleton is convinced must be a forgery--several murders occur that seem related to the manuscript. Polish police investigator Josef Padlow believes Middleton might be in danger too, and the American races back to the States, fearing for the welfare of his married, pregnant daughter, Charlotte Middleton Perez. Much of the main action thereafter occurs in the United States, primarily in Washington, D.C., and Baltimore, Maryland. But significant developments also occur in Italy and Africa, giving a strong international flavor to this serial thriller. With a multitude of robust writing talents involved in this project, the characters pitted against Middleton are rendered in complex and diabolical fashion: Faust is the main antagonist, a man who aided Yugoslavian war criminal Rugova (his code name, Faust, was given him by Middleton’s intelligence team); Eleana Sobersky is Faust’s wily and very deadly cohort; and Rukavshin is a brutal murderer. Besides Charlotte and Harold Middleton being in danger, Felicia Kaminsky, the musician niece of Jedanok the piano tuner, and Charlotte’s husband, Jack Perez, also face harm at the hands of the vengeful Faust. Of course, there are plenty of law-enforcement types hovering around Middleton and this tale’s increasing number of bodies. M.T. Connelly is an FBI agent with good cop instincts; Emmitt Kallenbach at first appears to be nothing more than a paper-pushing administrative feebie, but under the pen of subsequent writers, he develops more muscle. At the heart of The Chopin Manuscript lie musical treasures that were stolen by the Nazis during World War II, and a heretofore unknown musical score that has significant modern-day implications. For a work of such diverse contribution, the whole of Chopin is virtually seamless, and the tension mounts from chapter to chapter. A congratulatory nod goes not only to each succeeding author, charged with enriching the plot and characterization, but also to editor Jim Fusilli, who lent a guiding hand. Lisa Scottoline does a wonderful job with Charlotte Middleton Perez, as does Erica Spindler, both women giving her character depth and pathos; Peter Spiegelman (Red Cat) and Fusilli tackle multiple character developments, furthering the tempo; Joseph Finder, James Grady, Ralph Pezzullo, and John Ramsey Miller all add color and realism to the law-enforcement angle; David Corbett’s chapter is hard-boiled, urban, and gritty; David Hewson and John Gilstrap set their chapters in Italy, heightening the overseas connections; S.J. Rozan takes on the character of Leonora Tessler, the one-time lover of Harold Middleton and a former intelligence teammate, now living in Africa; P.J. 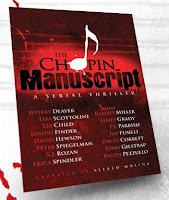 Parrish and Lee Child propel the musical elements of Chopin, giving them a far more complicated and devious significance than merely running notes on a page. Deaver supplies the pyrotechnic ending and fuses together the various running threads of the story. All of this is simplistic observation on my part, because each author produces a layered segment of setting, character, motivation, and plot. The sum is really quite extraordinary. So, what was it like to be one of Chopin’s contributing writers? Parrish (the pseudonym of sisters Kristy Montee and Kelly Nichols), Rozan, Gilstrap, and Fusilli were all kind enough to answer a few questions about the process. Anthony Rainone: What was the most enjoyable aspect of The Chopin Manuscript project? P.J. Parrish: Not knowing what was coming around the next curve in the road. When you write alone, you are in full control, shifting the gears, watching the speed. But for this story, we were only one of many passengers until it was our time to drive. And if the writer before us left us in mid-spin? Well, there was nothing to do but steer out of it. Very exhilarating! S.J. Rozan: Being part of something I’d never done before, a serial book. Jim Fusilli: Opening an e-mail from a contributor and reading the latest chapter. Without exception, I was surprised by their decisions. John Gilstrap: For me, the most enjoyable aspect was the uniqueness of it. I’d never participated in anything like this serial-novel project. It was fun to see how all of these combined imaginations were able to contribute their unique gifts to a story that was going in a direction that none of us could anticipate. Rainone: What was the most challenging aspect? PJP: Weaving the many threads. Because there were so many plot points and characters, we felt we had to take on the role of integrator rather than innovator when our chapter came up late in the story. So we purposely chose to tie up some things--but added one small twist that gave Lee Child something fresh to chew on. SJR: Trying to move the plot forward when I didn’t have any sense of an overall arc. JF: Trying to figure out my role as editor. In the end, it seemed clear that I just needed to stay out of the authors’ way, coordinate their contributions, and make sure we had a consistent style that didn’t infringe on the distinctive way they write. JG: The biggest challenge for me, I think, was to keep the story moving forward, despite having no clue where it was going. As an obsessive outliner in my own works, this business of being interesting and exciting while driving blind turned out to be much more challenging than I had anticipated. Happily, each of the authors were doing their best to make a good story. Knowing the playful nature of my colleagues on the project, I’m sure they all fought the same temptation as I to introduce some bizarre plot point, just to mess with the heads of future authors. Rainone: What are your views on doing an audiobook without a co-existing printed version? Also, can you envision this type of collaboration becoming popular? And what about writers doing exclusive audiobooks (without a print companion) as a future trend? PJP: To us, writing a book is an aural experience to begin with--much like sitting around a fire listening to an enthralling storyteller. Good writing has a music and rhythm, whether it is taken in by the eye or the ear. So yes, I can see where an audiobook exclusive could find a permanent niche. Especially with the ear-bud generation. SJR: Actually, I never focused on that when I was writing. The storytelling process is the same, and especially for me as a writer, because I provided my contribution as written words, not spoken ones. [As far as collaborations becoming popular], I’d say no. I’d be happy to do [a collaboration] again, but basically we writers like to write books we dream up and have control over. As to [audio books becoming a trend], I have no idea, because trends in media are beyond me; that’s market-driven. JF: I don’t really care about delivery systems in any media. If it’s in narrative form, I want the story told through the experiences of the characters. How it arrives in my mind doesn’t matter much to me. If it’s something I wrote, I don’t care how it’s delivered as long as the prose is appreciated. JG: For me, personally, audiobooks will never take the place of printed books. I like to interpret the writer’s voice though my own filters, instead of having it interpreted for me by an actor. As a businessman, however, I have to recognize the decline of available time in people’s lives to physically curl up with a book, and if the market proves itself, I’d be happy to supply the demand. I would not be at all surprised to see audio-only books in the future. Rainone: Would you do your own audiobook without a text version? PJP: We’re Luddites, wedded to the printed page. But anyone can change. And change is always stimulating for a writer. SJR: If that’s what the contract was for, sure. But I’d do it the same way this was done: I’d provide a text version for an actor to read. JF: Sure, and I’d write it for the ear. There are things you can do that work better for the ear than they would on the page. I mean, it’s different writing a piece of journalism for NPR than it is for The Wall Street Journal. I think it’d be great fun. JG: I don’t see why not, but I’m not entirely comfortable with it. There’s a pecking order in the publishing business that I don’t think anyone’s comfortable with, but it exists nonetheless. Hardcover releases are deemed more acceptable than paperback originals (for reasons I don’t begin to understand), with the result that PBOs generally get very little respect from the literary press, and they rarely get active promotion from their publishers. If audio-only books were treated with so little regard, I might be disinclined to do one. That said, The Chopin Manuscript has gotten a lot of favorable press thus far. If the future reception for other audio-only books is warm, then I’d be delighted to do another. I hate to be that market-driven, but there you go. Rainone: Would you participate in this type of project again, and why? PJP: Definitely! This was like being asked to play bass in a cool garage band! Plus, it was instructive. We are used to collaboration, and it works for us because our two egos are always subjugated to what we have come to call “The Third Eye”--the story itself. The story always wins out. But when you have 15 creative egos (and I mean “ego” in the positive sense) it’s a different process. Without the usual communication and consultation of a collaboration--nd under pressure of a tight deadline--this project forced us to write with more nimbleness than usual. SJR: Sure. It was fun. JF: Yes. To have another chance to see how talented and successful writers work would be enough incentive for me. That was really the best thing about it--getting to see how someone like Jeff Deaver, David Hewson, Lisa Scottoline, Lee Child, and the others develop characters and handle action to tell their stories. JG: I really had a lot of fun with the serial nature of the book, so yes, I’d jump at the chance to do another one. Rainone: Were there word limits and turnaround time frames? PJP: You bet. The editor, Jim Fusilli, is a great cat-herder. SJR: Yes, though I don’t remember the word limit now, and the turnaround was very fast. JF: No word limits, but each author had about two weeks. JG: The deadline was extremely tight, just a couple of weeks, so I guess that inflicted a kind of word-count limitation, if only by default. Jim was quite the (pleasant) task master. Every couple of days, I got an e-mail asking how I was coming along. Rainone: How did you find out the conclusion of the novel? Were you allowed to read it, or hear it, prior to publication? PJP: No, it was a total surprise to us. We read only up to the point of our own chapter, and it was great fun to read the ending. Like opening a Christmas gift you had a part in choosing but didn’t know quite what you were going to end up with. SJR: Barely, and certainly not prior to writing our chapters! JF: I didn’t know about it until I opened the file. I thought it was great. Very vivid and surprising. But inevitable too, which is always a sign of great storytelling. JG: I’ve yet to hear it, but I did get a chance to read it before it was released to the world. I enjoyed the way it turned out, even though it was completely different than the direction I’d have taken it. Rainone: Getting inside characters and plots is difficult enough when you write your own novel. What approaches did you take with this project? How were you able to maintain the continuity while investing your own passions in The Chopin Manuscript? PJP: Writing one of the later chapters made it easier for us, I think, because our choices were narrowed to what had already been established. To torture another metaphor, we were the mid-relievers and we saw our “job” as building toward the climax but leaving enough threads dangling for the closers. We were tempted to tie things up--all writers have that urge--but we knew it was better to craft a turn-the-page ending to our chapter, so the final contributors could run with it. We did decide to kill off a main character, however, because we felt the stage was too Hamletesque to allow for a good climax. And we decided to hone in one character we cared about and really give her a reason for being in the final act. Character is plot and plot is character. JF: I think we got off to such a strong start with Jeff and David Hewson that we all slipped into their mindset or a sort of collective mindset. For my chapter, I wanted to pick up what S.J. Rozan started--in fact, you can put her Chapter 4 and my Chapter 10 side-by-side and you’ll find one flows from the other. With continuity, a funny thing happened: Both John Ramsay Miller and Peter Spiegelman decided to use part of their chapters to summarize the story for the readers. That’s a tribute to their professionalism and their instincts as authors. SJR: I took a single character to focus on, and a plot thread I thought had been underutilized and would take the book in a new direction. JG: Your question reflects what was my biggest concern when I agreed to the project. When you look at the slate of contributors, you see that every one of them has a very strong voice in their writing. I worried that the end product would be choppy and disjointed, and that my own voice would screw up the harmonies of the others. In the end, I decided not to worry about it. I just chose a character that interested me, and I fleshed her out a little and gave her some interesting stuff to do. When I read back over it now, I think that all the voices blended well. Rainone: This last question is for Jim [Fusilli, the editor of The Chopin Manuscript]. Who conceived the project, and how was it presented to the authors? JF: The International Thriller Writers conceived the project. It might’ve been M.J. Rose [The Reincarnationist]. I believe M.J. approached Jeff [Deaver] and me at the same time. Then Jeff suggested a few contributors, and I asked a few people I respect. We built the team rather quickly.